When it comes to your home or business, it probably feels like it’s fairly easy to add effective security. After all, there are a wide variety of different lock options and a security system with cameras goes a long way toward deterring theft attempts. Unfortunately, protecting your car isn’t quite as easy! Sadly, it’s not really feasible to just hook up security cameras and leave them on constantly for our cars the way we would at home. 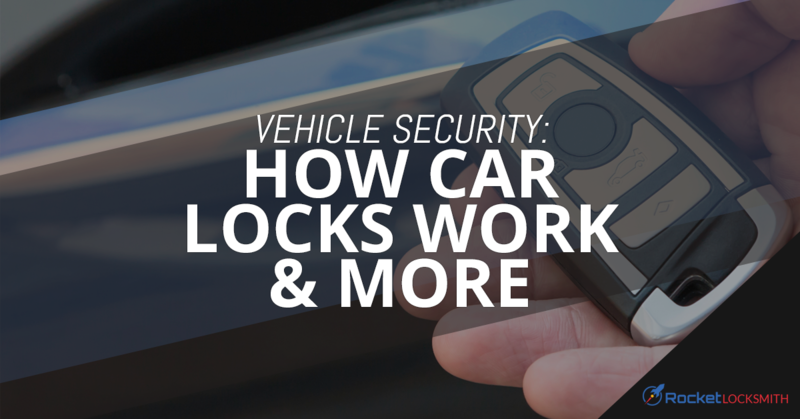 If you want to improve your vehicle’s security, there are a few things you can do! As your local St. Louis auto locksmith experts, the Rocket Locksmith team has a few suggestions for you. Let’s start with the basics: if you have an electronic key fob (also called a transponder key), you have power locks. If you still have to manually turn the key to open your car door, well, we’re impressed a car of that age is still running well! Power locks have actually been around since the 1950s, but electronically controlled power locks quickly became the standard after they were introduced in the mid 1980s. Today, most cars are secured by a remote keyless system that controls the power locks; basically, there is a short range radio transmitter inside your transponder key which sends signals to the receiver in your car. Each receiver and transponder fob is encrypted and set to send and receive a specific signal, which is why your key fob doesn’t unlock every car in the parking lot. However, this generally means that, when your transponder key dies, your dealership will tell you you have to bring it in to them for reprogramming. This isn’t the case! Your local auto locksmith can generally repair or replace a broken transponder key fob more quickly and less expensively than the dealership, and it will work just as well as usual. Unfortunately, just because you can control your power locks remotely, that doesn’t mean they will be foolproof against thieves. Install a security camera… kind of – When your car is parked at home, a wireless baby monitor can function like a car-ready security camera. Many modern options offer night vision and audio so, with the sound turned on, you’ll hear if someone breaks the window to get into your car. Unfortunately, this only works within a certain distance to your car, so it’s not a great all-around solution. Take your steering wheel with you – With a quick-release steering hub, you can simply pop your steering wheel off every time you leave the car. Or, if you don’t want to have to carry your steering wheel around, you can get an immobilization device like The Club to prevent your steering wheel from turning. This means thieves can’t just run off with your vehicle, but it won’t do much to stop them from breaking in and taking any valuables. Get an alarm system – Systems like OnStar include a GPS tracking system and live help when you need it. The presence of an OnStar system will usually deter thieves because they know your vehicle will be able to be tracked and recovered. Many car theft prevention methods are aimed at deterring thieves from taking your car, but they don’t do much to stop a thief from breaking in and taking whatever you have inside. In order to make your car seem like less of a target, the best thing to do is make it appear that you don’t have anything in your car, and therefore nothing to steal. If you’re leaving things in your car, try to tuck them out of sight, and if you have an SUV, invest in a pull-out cover to disguise your trunk space to make it appear empty. If you’re running multiple errands, be sure you’re stashing bags in your trunk before you move on to the next location, as many thieves will monitor parking lots to watch who is loading their car with a bunch of bags. For more information on protecting your vehicle, or for help with any issues with your vehicle’s locks or transponder keys, trust your local auto locksmith for quick, professional service. Contact Rocket Locksmith today for more!